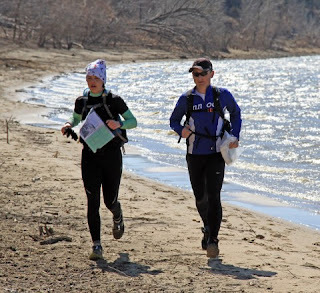 A few days after I got back from Africa I got an email from another orienteer/adventure racer asking me about a race in Kansas...did I know the promoter, had I ever done it, etc. I replied back that I didn't know the promoter but since they are in the same series as Bonk Hard events, they are probably okay and, by the way, if he needed an extra teammate I might be interested. So we traded a few more emails and, despite not really having met each other except for about 5 minutes at the Possum Trot, decided to race as a 2-person coed for Lake Adventures' Break Up 10hr AR in Milford, Kansas. How did I ever agree to race with someone I've barely met? 3 reasons: first, Andrei's a super-good navigator; second, he lives in MN; and third, his Attackpoint log tells me he's super-fit. Done, done, and done. Team Space Monkeys FTW! Andrei and I have our second official meeting in the parking lot of a Days Inn on the west side of Kansas City. In any other situation this might sound completely sketch but something about the AR community makes it totally okay. We load up his gear into my car because it has a roof rack for 2 bikes and hit the road for the remaining hour's drive to Milford for the pre-race meeting. At the meeting we collect one 1:24000 map, 2 aerial photo maps, and coordinates for 30 CPs. The race instructions are a little confusing because we have a few loops we can take in any order, but I'm pretty sure that once the points are plotted we will be able to visualize the course. Just in case, though, I save the Race Director's phone number for questions. Race check in. Andrei and I are at the registration table while other teams are already plotting maps. We hit a Domino's Pizza on the way back to the hotel for my favorite pre-race meal. It is soooo good. We plot all 30 CPs back at the hotel. 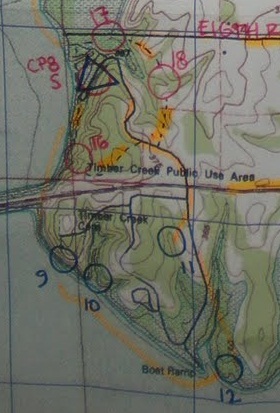 It's a frustrating process because the clues are very specific ("driftwood" and "wood steps" for example) so when we plot each point it's hard to know if we're correct or not (better clues would have been features shown on the map, such as "creek junction" or "spur"). The basic layout of the course turns out to be a short fast run followed by a biking leg back to the Start/Finish. Then we will have a cloverleaf of biking, trekking, and paddling legs where we can complete them in any order. 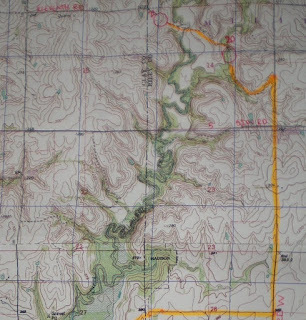 After completing all of these sections, we will bike out to a remote TA, do a short trekking loop, and then bike back to the finish. I'm a little disappointed that there is so much biking because I believe trekking is really our strength, but I'm also relieved that there is only a short paddle because that is definitely NOT my strength. We get to sleep about midnight, all packed for race morning. We have a bike drop on the way to the race start and we decide to take the long way so we can check out the condition of the gravel. Turns out the roads are in great shape and should be quite fast. 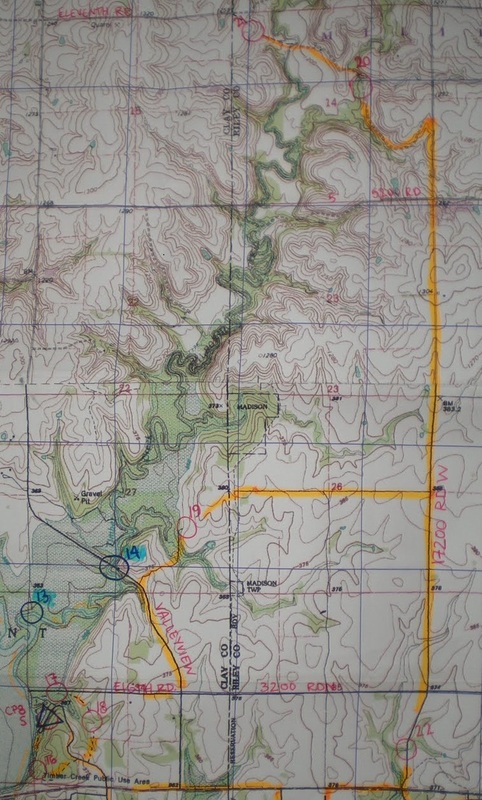 We also pass the Kansas Landscape Arboretum where some of the CPs are located and stop to check out the posted map. It's the same as the one we've been given in the race packet. 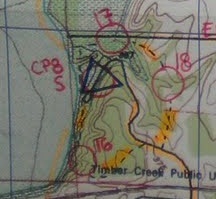 But, the larger scale of the posted map shows that what we thought was a trail, is actually a creek! So now we know not to ride there! We drop bikes at a park, making sure tires are properly inflated, and then drive over to the Start/Finish area at North Timber Creek on Milford Lake. There, we double-check our packs which seem disturbingly light but it's mostly a result of the great weather and minimal gear list. The RD clarifies the rule on personal paddles, making us leave ours in the car. Soon, it's time for some jogging and assembling at the start line! 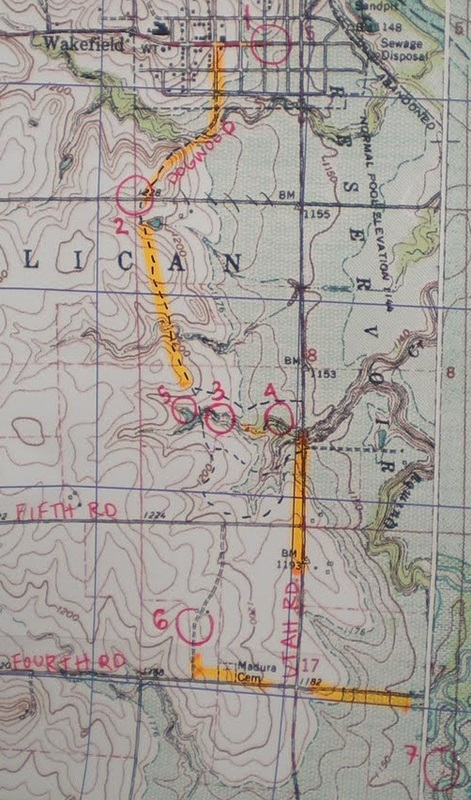 The first trek, from the CP8/S triangle in the upper right corner to CP1 in the middle of town. The map really did have that crazy mis-match on it. Leading the pack across the bridge. GO! We decide to take a direct, shoreline route to the bridge so I follow Andrei up into a little bit of singletrack and then back down onto the shore for some quick running. We are in the company of a few teams but we are moving well. We climb a concrete culvert onto the highway, cross the road, and run on the shoulder of the road. We are going pretty fast for me but Andrei seems ridiculously comfortable with the pace, chatting away as I'm intently focusing on the road. I don't dare look back because it would take too much effort and we are in the lead anyway. 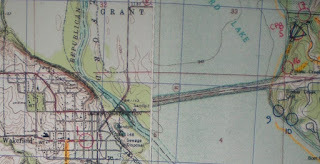 We cross the bridge, cut through some open land, and charge into CP1 in the lead. We punch quickly, change shoes, and race out of there still with the lead although a few teams are hot on our heels. 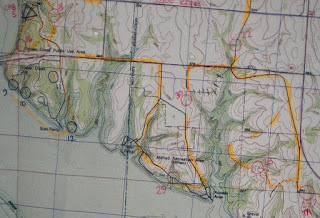 The first biking leg, we went 2-5-3-4-7-6 and then back to the start (off the map). We get out of town and onto the gravel road with only one small glitch of Andrei's blinky light falling off, which we retrieved and stuffed in a pocket for the rest of the race. We have a slight miscommunication at the first fork, and another 3p coed team catches us, but soon we are back on track and we follow them into CP2. Another 3p coed team punches right behind me and we leave as a pack. But, both teams veer off onto a trail in the first reentrant, but we know we need the second reentrant so we keep going straight. The trail is where we think and we punch CP5 cleanly, which is hanging on a small footbridge. We have plotted CP3 on the north side of the creek so we enter the Arboretum and get on the trail, scouring it for the clue "wood steps". There are no wood steps. We are still alone but I'm thinking that we'll have company any minute. We conclude that there are no "wood steps" on the north side of this creek so we try the south side and finally find them. We also punch CP4 before heading out of the Arboretum. We are met with a brisk headwind as we bike south on Utah Rd to CP7. We make the turn onto the access road and I pull up next to Andrei to ask some question about CP7, I don't even remember what it was. The next thing I know, our handlebars are tangled up and Andrei is thrown from his bike onto the gravel. Ow. That was not a nice thing for me to do. I stop and run back to check on him, he's moving but clearly in pain. Still in race mode, I decide to gather both bikes and jog them down the road, to try and make progress to CP7 but giving Andrei time and space to assess the damage. Pretty soon, he jogs up and says he's ready to start riding again, despite some intense right shoulder pain and road rash. Yeah. Stud. So we punch CP7 and then go get CP6 which is in someone's driveway. Then all that's left is a comparatively long bike back to the Start/Finish, but we have an awesome tailwind so we try and get some calories in while the going is good. Andrei pulls across the whole bridge so it's clear that while his shoulder may be injured, his fitness is still very much intact and we can still have a good race. First leg of the cloverleaf...biking 17-18-16. We arrive back at the Start/Finish in the lead and ready to start our cloverleaf. 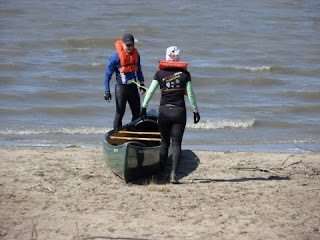 We have decided to do these in bike-paddle-trek order (biking start because we already have our gear on, then paddling next to get it done, then trekking to warm up from the paddle). The bike leg is short and easy, but we do get a little bit of singletrack which makes me happy. 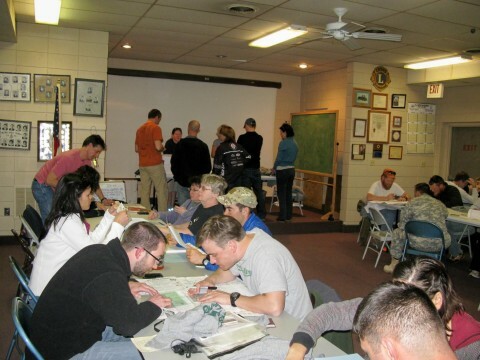 We return to Start/Finish and things are busy with more teams arriving and picking their leg order. There are canoes available so we grab one and prepare for the put-in. Second leg of the cloverleaf...paddling 15-13-14. The winds have picked up considerably and Milford Lake is starting to look pretty choppy. We had originally planned to go 13-14-15 but there are some teams in front of us going directly to 15 so we decide to follow them instead. I am in the back of the boat with both packs to try and equalize the weight difference. We are also using race-mandated canoe paddles. 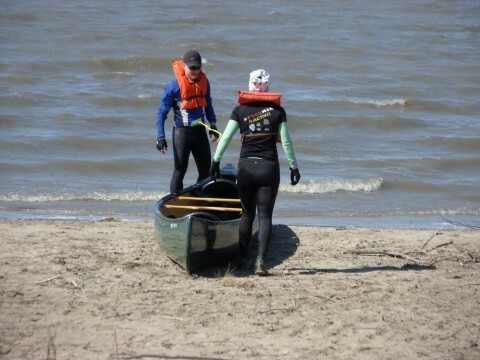 After my difficult experience paddling at the Bonk Hard Chill, I am nervous about controlling the boat in these high winds. But, surprisingly, the boat is handling pretty well with the canoe paddles and we take a decent line to 15, trying to cut into the wind at an angle so we don't get broad-sided by the chop. The beach is super shallow so I jump out of the boat and run the last 10m in chilly water to the CP, while Andrei hydrates and medicates. We have dropped behind the other teams a bit but we can still see them as they paddle up the small river. We follow them into the river and I'm relieved to find the current negligible and the banks very protective - there's almost no wind in this section. 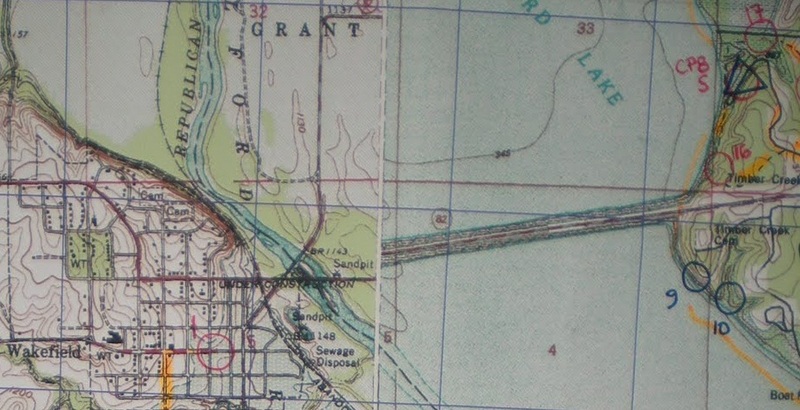 We paddle upstream to CPs 13 and 14. Andrei can only really paddle on the left side of the boat so I steer as best I can and we punch both CPs with no issues. When we get back into Milford Lake, the wind has picked up even more and now there are whitecaps on the water. 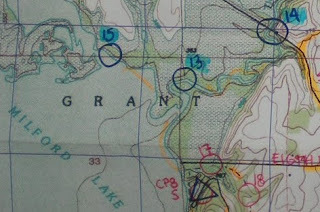 There's no way we can make forward progress in these conditions, so we navigate to the east bank of the lake and decide to run the canoe back to Start/Finish. Running in the water while stooped over is not very effective, so I jam a paddle into the bow's molded plastic handle to make a sort of push-bar. This method works pretty well and soon we are back at the Start/Finish, with soaking wet feet and packs but at least we are done paddling! Finally back at the beach! We re-rack the canoe per race rules and the boat owner's meticulous instructions ("a little farther back, okay now push it in more to the center, okay that's good"). We sling the dripping-wet packs onto our backs and start running to try and warm up. I also ferociously consume six (!) Oreo cookies in an effort to stop being hungry. 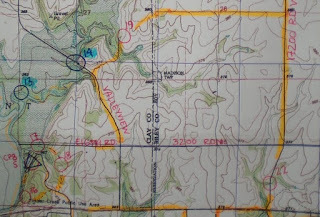 Third leg of the cloverleaf...trekking 11-12-10-9. We hustle out of the campground along the access road, cross the highway, and continue running down the road. CP11 is plotted in a shallow reentrant, but the clue is "open area" which is adjacent so we try to check both locations. It takes 2 attacks, but both are short. 12, 10, and 9 are equally as straightforward and soon we are back on the beach, retracing our steps from the first leg of the race on the way back to Start/Finish. We are running along and Andrei tells me we have to go faster, "This is 24-hour pace. We have to go 8-hour pace." 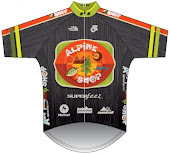 I'm a little incredulous that I have another sustainable gear inside me but I do my best to go faster. Finishing up the trekking cloverleaf. We arrive back at Start/Finish having completed the cloverleaf in first place. We take a little extra time in transition to change into dry socks (and dry bike shoes) but we are soon gone. First part of the third bike leg...CP19-20-21-22. We take an abandoned road (Eigth Rd) east out of the campground. We are both itching to get onto the open gravel and start going fast. There is an old metal gate across the road which requires us to stop and hoist the bikes over. This isn't easy with Andrei's shoulder injury but we manhandle both bikes and make it work. As we're passing Andrei's bike over the gate, I hear a hissing noise and my heart sinks. It takes a few seconds to locate the source but it's his back tire for sure, and maybe the front tire and fork as well. We decide to change the back tire immediately while Andrei does more investigation on the front's situation. We pull the rear wheel off and as I'm removing the tire, I find AT LEAST FOUR thorns that have penetrated the tire and punctured the tube. Not cool. I put a new tube in the rear as Andrei announces the front has thorns as well, which means we will have to change it too. Except, we only have one spare 26" tube between us (I'm on a 29er). A 3p coed team, Rev3/MK, has just passed us, but they only have 29" tubes (they offered one but it wouldn't do us any good). So we patch the 26" tube we just removed from the rear and throw it into the front. As we're pumping this tire up, another 3p coed team passes us and they have an extra 26" tube, which they SO GRACIOUSLY give us and continue (thanks, 3 Builders And A Shocker!). We stash the new tube in a pack, put both wheels back on the bike, and cross our fingers that the patches will hold. We hit the gravel and try to go fast, but it's clear the tubes are slowly leaking, the front one especially. We make the turn onto a faint gravel road to CP19 and have to hoist the bikes over a gate again. Because we're stopped we put a few pumps of air into the front tire and continue. We locate 19 easily enough and as I punch, Andrei puts more air in. We catch up with 3B&AS and follow them as the track dead-ends into a farmer's field. Crap. 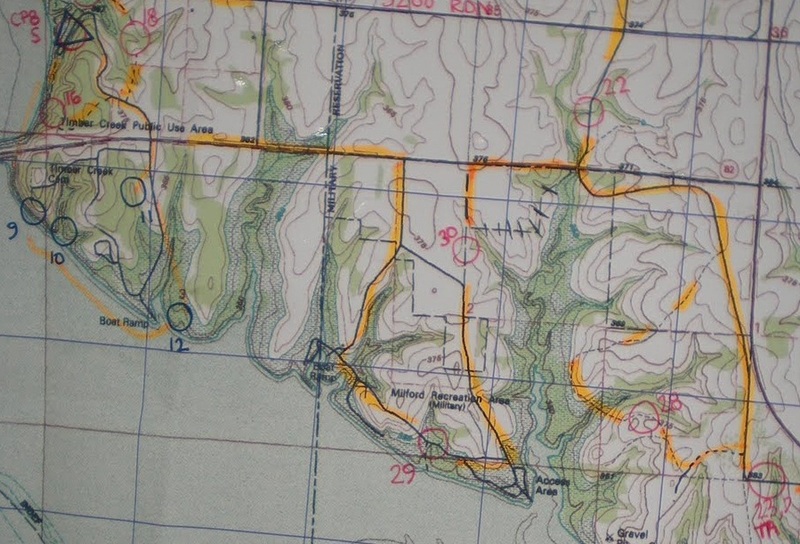 Good thing Andrei is reading the map's contours more than man-made features so we just bike-whack up a hill and find the gravel road we need. We make another turn and soon we have a huge tailwind on the way to 20 and 21. 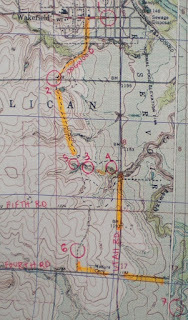 We are looking for a jeep track that's shown on the map but there is nothing on the spur that we need. 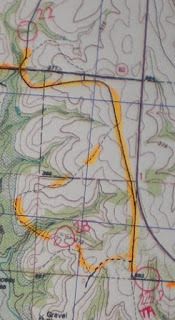 On the next spur, however, there's a similar-looking track so we take that instead and cobble together a route to CP20. 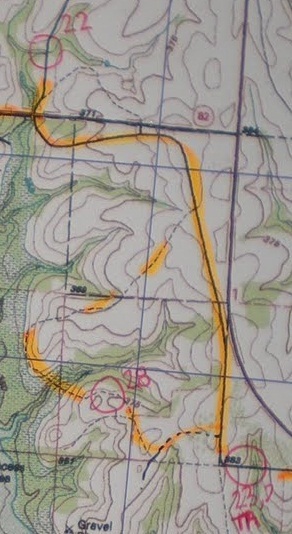 Again, since Andrei is reading contours/features more than man-made stuff, we are able to locate the CP pretty well and find the track we wanted originally to bring us to CP21. In between, we run into the other top teams (3B&AS and Rev3/MK), all having tire issues. I'm bummed for them but also relieved that we're not the only ones. We make it back to the main gravel road only stopping a few more times for re-airing. Then, it's a long southward haul into a strong headwind. I try to pull as much and as fast as I can, thinking in some way it will make up for the crash I caused earlier. As we near CP22, Andrei decides he wants to put the new tube in the front tire and be done with it already. Since we're on a long straightaway and in the lead, we pick the next valley so our stop won't be in sight of the other teams (and potentially act as a carrot for them). We change the front as fast as possible and, incredibly, no one passes us. We continue biking south to CP22, and as we punch I spot 3B&AS cresting the hill behind us, not more than 5 minutes back. Crap!! We race to CP23 where we will transition to a short trek. We hold 3B&AS off on this segment, and as we roll into the TA I don't see any other bikes, meaning we are currently leading the race, but not by much. We check in with the volunteer, transition into trekking shoes, and practically sprint out of TA just as 3B&AS is rolling in. Since Andrei is so good at nav we want to get far away from them so they can't follow. I'm feeling pretty sluggish but I'm doing my best to run up the gravel road on our way to the first CP on this short loop. The wind is still blowing pretty hard but it's actually rather warm - if we had more of a gap I would stop and change my Buff (from a hat into a headband) but I'm too scared to give away even a second. 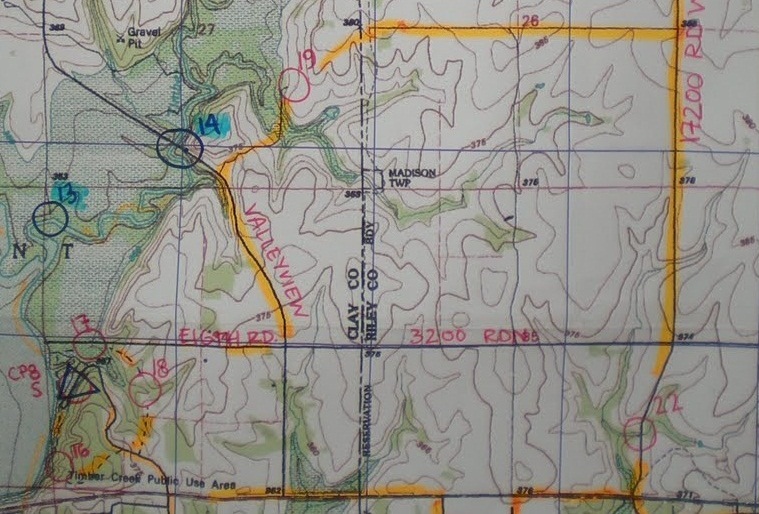 We attack CP24 from the road and it takes a while to locate in the thick brush (the clue is "cedars" which is infinitely unhelpful). As we re-emerge from the thicket, we see 3B&AS going into it so we know our gap is slim. We get back on the road to CP27 which is supposed to be a "shoreline cedar". 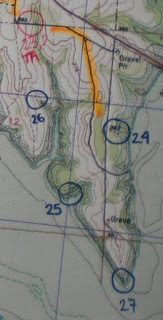 As we approach the point, there are about 10 shoreline cedars so it takes about a minute to find the correct one and punch. But, as we are leaving we don't see 3B&AS anymore so we might have a slightly bigger gap. We have to take a slightly circuitous route to CP26 and I'm feeling the effects of unseasonably warm temperatures and a brisk pace. I'm basically out of water in my bladder but I know I have a 1/2 bottle left on my bike. Andrei reminds me to be strong like a buffalo as we run to 26, punch, and run back to TA. Despite the time-wasting at CP25, we haven't seen 3B&AS again, and Rev3/MK at all. We are either in still in first or really far behind in second. As we transition, I don't even want to ask the volunteer what the placings are so we just throw shoes on, add some air to Andrei's tire, and get out of there. The first control on this final bike leg, CP28, has the maddening clue of "shrubs". So we catch a gravel road onto the hillside and start looking for shrubs of any kind. There are 4 or 5 patches of them, but none have a flag. I'm beginning to panic. We run about 150m beyond where we drop our bikes without finding anything, and decide to go back to the bikes and regroup. I am on the low side of the hill and Andrei is high. As I get closer to the bikes, I hear a shrill whistle and I know that he's found it. Turns out the flag is hung less than 50m from where we dropped the bikes, just hidden from our approach direction. As we leave CP28, two really bad things happen. First, I get a flat. Second, we see another 3p coed team crest the hill on their way to 28. Thankfully I have a tube so we perform a smokin-fast tire change and Andrei reinflates the 29" tire, with a frame pump, with an injured shoulder, in about 60 seconds flat. I am in awe. We hustle out of the area and commit to going as fast as possible for the remainder of the race. Neither of us want to lose after driving so far and being so close to the lead all day. We are motivated. 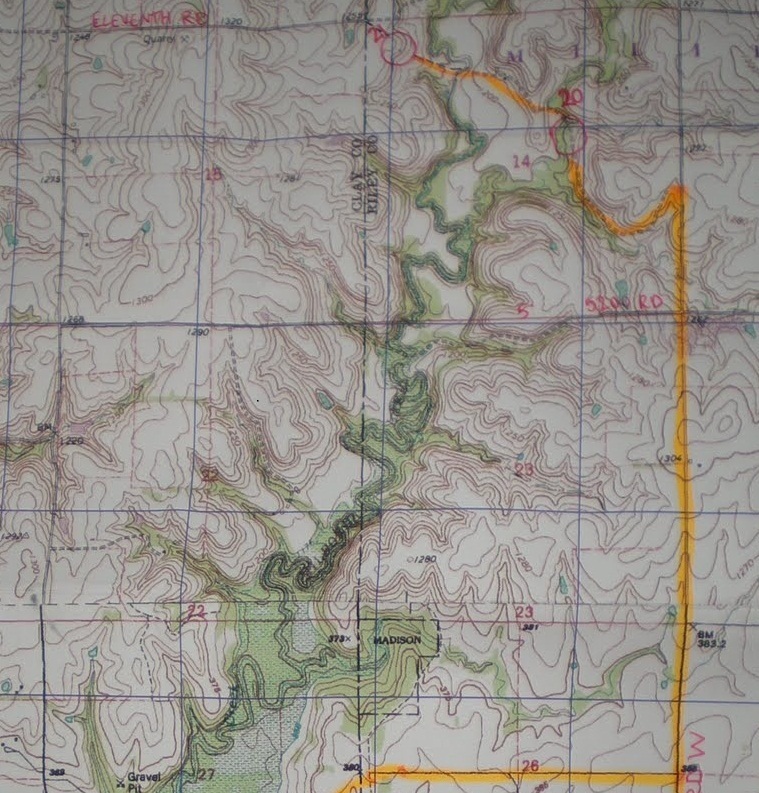 There are two route choice options to CP30 and we pick the longer, safer route since I am pretty sure we are in the lead and we don't want to mess things up with missing jeep roads now. So we go around a large, marshy-looking reentrant and pick up CPs 30 and 29 without incident. Now all that's left is to hammer back to the finish. We haven't seen any other teams so far so we're either way in front or way behind. Not taking any chances, we keep the pace high all the way back to Start/Finish. As we roll in I'm scanning the beach for bikes. There are none. The Race Director asks us if we are finishing, we say yes, and she says we are the first team back from the long course. That's good news, but we can't celebrate until our passport is checked. I crash into a camp chair, put my feet up and nervously wait for the verdict. And the verdict is...WE WIN!! 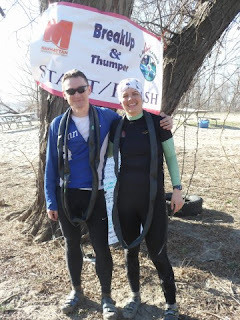 Posing with our punctured tubes! I am relieved that we held on for the win after such a drama-filled day. When we were passed while fixing the first 2 flats, my heart was absolutely sinking. But, thanks to the generosity of other teams (again, THANK YOU to 3 Builders & A Shocker for the spare tube) and our unwillingness to give up, we clawed our way back into the lead pack and then built a gap for the win. After taking a few quick photos at the finish line, we load gear back into the car and I decide to go sit in the lake as a pseudo-ice-bath. It is cold but feels amazing and I'm hoping it will speed my recovery (mostly because I have a healthy respect/slight fear for GoSonja's schedules). Rev3/MK rolls in for second place overall (7:56) and 3 Builders & A Shocker is in third (8:06). It's fun to meet these athletes and we even have a little map-pointing session! Joy! Lake Adventures has promised a full-on BBQ buffet so you know I have to stick around for that. 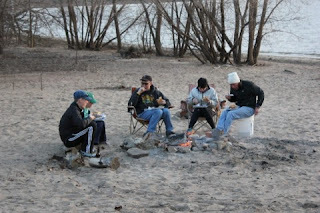 It's a really nice finish line atmosphere with a campfire on the beach, good food, good people, and awesome prizes! This is one of my favorite pictures. Space Monkeys hanging out with 3B&AS after the race, on a beautiful beach, with a beautiful campfire. Adventure racers are the coolest people!! 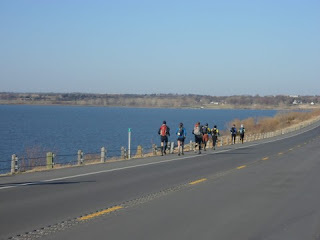 Fantastic race report! Gutty effort by both you and Dr. Dre. Thanks for the map uploads, awesome. Too bad about those clues, but otherwise sounded like a great race. thanks!! i am really really proud of this one. Great report, and congratulations on the win! You've had a great AR year so far. I laughed at your line about teaming up with someone you'd barely met once. My husband thought I was crazy to drive to Jeff City to spend the day in the woods with the Virtus guys when I'd only met Luke once. But the AR community is pretty awesome, and that turned out to be a great decision. Good luck with IM training! And congrats on the recent win - sounds like a great day. Do you ever make it to the east coast to race? yes nice to meet you too! i got really excited about your blog because you're right, not very many AR bloggers out there. i don't usually go to the east coast, LBL in KY (TN this year) is about as far as I have been. might have to change that soon bc it looks like some awesome racing out there! !